Thanksgiving came a little early this year at FAME. One of our former patients paid us a visit. Some of you may remember Martina, a patient who came to FAME in 2014 with second and third degree burns over 35% of her body, some already infected. She ended up spending the next 342 days in FAME’s inpatient ward fighting for her life and being cared for by our team. Well, Martina got word that visiting surgeon, Dr. Duane Koenig, had returned to FAME Medical for another volunteer stint and she wanted to personally thank him for the central role he played in saving her life. You see, Dr. Duane is the one who brought skin grafting to FAME Medical, donating the equipment and training his Tanzanian colleagues in the procedure. He personally performed hours and hours of grafting on Martina and was very often at her side during the multiple dressing changes and debridements that followed. And in his face she saw someone completely and absolutely unwilling to give up on her. By the time Martina was finally discharged, Dr. Duane had already returned home to Nebraska. Having graciously thanked the others involved in her care, she still had not been able to “properly” thank the man whose face gave her hope thru her darkest moments, until two weeks ago when she and her husband received word of his return. How to thank someone who saved your life? How about a shuka, a goat and two chickens -- that was Martina’s gift to her friend Dr. Duane. And his response, “Thank you. I would have gone to hell and back for you. I don’t need anything. My reward is to see you beautiful and smiling.” It was an extraordinary moment, one filled with joy, smiles and laughter - a magical moment between a patient and a doctor who share a special bond for life. Happy Thanksgiving to our generous supporters and partners, who continue to pave the way for powerful moments like these between patients and doctors at FAME Medical. We are forever grateful to be sharing this journey WITH you. We continue to see a wide variety of patients at FAME Medical. Not only are there lots more patients coming to FAME, they now range from the very healthy and just checking category, to the comatose and at death's door group. I rejoice in the increasing number of patients being monitored for chronic or life-style diseases. For the most part, these are otherwise healthy people whose clotting time is being monitored to prevent stroke or other cardio-vascular complications, whose blood sugar needs to be and can be controlled, whose lipids are being monitored and controlled, or whose thyroid levels are monitored periodically to keep them functioning well. These are conditions that, even 5-10 years ago would remain unmonitored and possibly even undetected, as many are asymptomatic until you're in real trouble. Being controlled and being monitored before an incident occurs increases the likelihood that they will not become clinical or critical. Of course, with so many more patients in dire straights when they arrive, we are unable to save them all. That is a harsh reality that cannot be changed. But the miracles continue to abound and astound. Six-year old Allan came to FAME a few weeks ago with a serious medical issue: he could not swallow food. Most of us count eating food as one of the great joys in life, and how easy it is to take it for granted. Although Allan greeted the medical team with smiles and laughter, his situation was grave: he weighed only 22 pounds (10 kilos), the weight of a healthy one-year old. To complicate things, his small malnourished body was suffering from chest rattling pneumonia. FAME Medical treated Allan for his pneumonia and started him on nutritional support. After a few days of charming the doctors and nurses, he was stable enough to return home. Yet Allan’s esophagus was still constricted and only a complex surgery could address this congenital problem. FAME Medical began the search for someone who could operate on Allan, sending emails to the extended family of FAME supporters. Luckily, a few people were well positioned to help him. 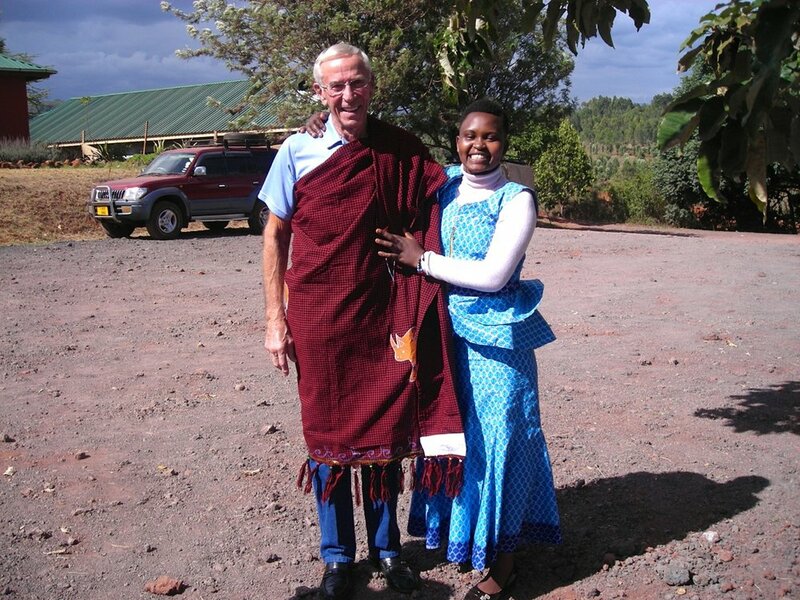 The first was a doctor in Arusha who had seen Allan before and knew of his need for esophageal surgery. A specialized pediatric surgeon from Finland came to volunteer at her hospital, so she called FAME and invited Allan to return for surgery. The second was an anonymous donor, well aware of his situation, who committed to helping him get the best care possible. It would be remiss not to mention Brad, the nurse practitioner at FAME, and Angel, the social worker, both of whom took on the responsibility of traveling with Allan and his mother to Arusha to support and advocate for the family. I also traveled to Arusha, and serendipitously, had the same blood type (and arguably the same attitude) as Allan: B positive. His mother Mary and I both donated in case he needed a transfusion during the procedure due to complications. In some cases, an esophagus can be dilated with a balloon or by other means (my grandmother recently had such a surgery), but after laparoscopically exploring Allan’s esophagus, it was clear it could be addressed only through removal of the strictureand resectioning the esophagus to the stomach. The FAME team reviewed possible outcomes with the specialist and guided the decision that it was too dangerous to perform the partial esophagectomy on his compromised body. He needed to build strength to endure the removal of the portion of his esophagus. Operating in his malnourished state could have lead to the worst outcome of all. As a means to an end, the surgeon inserted a feeding tube, or G-tube, into his stomach, allowing for nutrients to bypass his uncooperative esophagus and enter his stomach directly. I spent some time with Allan and Mary post-surgery and felt such compassion for them. He was clearly in a lot of pain and his mother was doing all she could to soothe him. This feeding tube, while clearly an essential step to improving his nutrition, I knew would be a big adjustment for both of them. A few days later, Brad and I joined up with the team at Rift Valley Children’s Village (RVCV) to check up on Allan. Another conspiring actor, RVCV, in addition to contracting FAME to provide medical care to the orphanage and community thru a mobile medical service, also provides daily health support, follow-up and education to the community, where Allan and Mary live. The RVCV nurse, social worker, and nutritionist worked alongside Brad and I to educate Mary about how to feed Allan through the G-tube. You can imagine the joy on all our faces when with our help, Mary mixed together the ingredients to make F-100, a therapeutic milk designed to treat severe malnutrition, and fed it to Allan through the G-tube. “Nice job!” Allan exclaimed in Swahili, and offered his mom a high five. The right to a healthy life may be universal, but the road to getting there certainly isn’t. Allan isn’t healthy yet, but his future is looking much brighter. He has a short-term solution that is allowing him to properly gain weight and build strength for the first time in six years. He has RVCV within walking distance, and FAME Medical a short drive away. Most of all, he has his dedicated mother who so demonstrably loves him. She is doing everything in her power to nurture Allan to health. At some point in the next year or two, Allan will be strong enough for a life changing surgery. He will wake up groggy in bed, free of his G-tube, with his mom nearby. He will take a few weeks to heal. And then, he will sit down to the first proper meal of his life. May the tears of joy – and not of hunger – flow that day.